Brouns, Fred 2018. Overweight and diabetes prevention: is a low-carbohydrate–high-fat diet recommendable?. European Journal of Nutrition, Vol. 57, Issue. 4, p. 1301. Noakes, Timothy David and Windt, Johann 2017. Evidence that supports the prescription of low-carbohydrate high-fat diets: a narrative review. British Journal of Sports Medicine, Vol. 51, Issue. 2, p. 133. Mansoor, Nadia Vinknes, Kathrine J. Veierød, Marit B. and Retterstøl, Kjetil 2016. 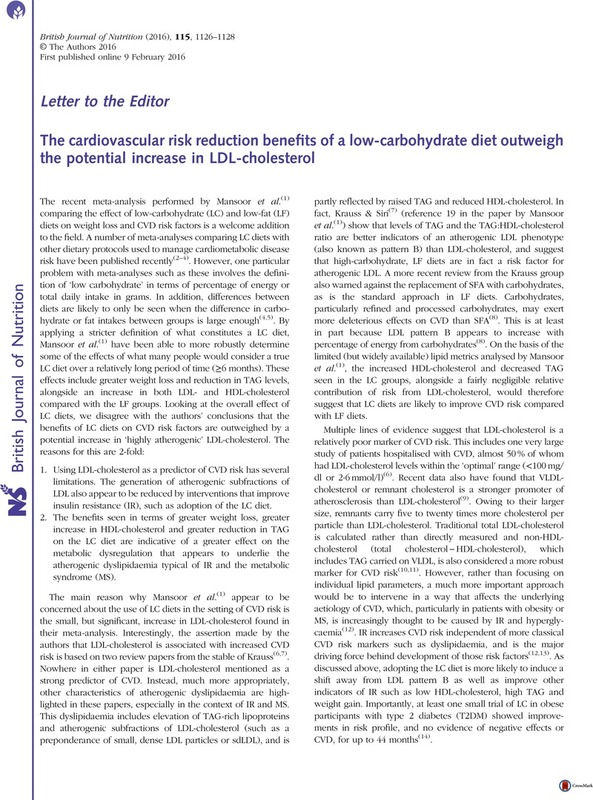 Low-carbohydrate diets increase LDL-cholesterol, and thereby indicate increased risk of CVD. British Journal of Nutrition, Vol. 115, Issue. 12, p. 2264. Bermeo-Ovalle, Adriana 2016. Dietary Treatments for Epilepsy: Why is this So Hard for Us to Swallow?. Epilepsy Currents, Vol. 16, Issue. 5, p. 312. 1. Mansoor, N, Vinknes, KJ, Veierød, MB, et al. (2016) Effects of low-carbohydrate diets v. low-fat diets on body weight and cardiovascular risk factors: a meta-analysis of randomised controlled trials. Br J Nutr 115, 466–479. 2. Naude, CE, Schoonees, A, Senekal, M, et al. (2014) Low carbohydrate versus isoenergetic balanced diets for reducing weight and cardiovascular risk: a systematic review and meta-analysis. PLOS ONE 9, e100652. 3. Sackner-Bernstein, J, Kanter, D & Kaul, S (2015) Dietary intervention for overweight and obese adults: comparison of low-carbohydrate and low-fat diets. A meta-analysis. PLOS ONE 10, e0139817. 4. Tobias, DK, Chen, M, Manson, JE, et al. (2015) Effect of low-fat diet interventions versus other diet interventions on long-term weight change in adults: a systematic review and meta-analysis. Lancet Diabetes Endocrinol 3, 968–979. 5. Feinman, RD, Pogozelski, WK, Astrup, A, et al. (2015) Dietary carbohydrate restriction as the first approach in diabetes management: critical review and evidence base. Nutrition 31, 1–13. 6. Berneis, KK & Krauss, RM (2002) Metabolic origins and clinical significance of LDL heterogeneity. J Lipid Res 43, 1363–1379. 7. Krauss, RM & Siri, PW (2004) Metabolic abnormalities: triglyceride and low-density lipoprotein. Endocrinol Metab Clin North Am 33, 405–415. 8. Siri-Tarino, PW, Chiu, S, Bergeron, N, et al. (2015) Saturated fats versus polyunsaturated fats versus carbohydrates for cardiovascular disease prevention and treatment. Annu Rev Nutr 35, 517–543. 9. McPherson, R (2013) Remnant cholesterol: ‘non-(HDL-C+LDL-C)’ as a coronary artery disease risk factor. J Am Coll Cardiol 61, 437–439. 10. Virani, SS (2011) Non-HDL cholesterol as a metric of good quality of care: opportunities and challenges. Tex Heart Inst J 38, 160–162. 11. Arsenault, BJ, Rana, JS, Stroes, ES, et al. (2009) Beyond low-density lipoprotein cholesterol: respective contributions of non-high-density lipoprotein cholesterol levels, triglycerides, and the total cholesterol/high-density lipoprotein cholesterol ratio to coronary heart disease risk in apparently healthy men and women. J Am Coll Cardiol 55, 35–41. 12. Laakso, M & Kuusisto, J (2014) Insulin resistance and hyperglycaemia in cardiovascular disease development. Nat Rev Endocrinol 10, 293–302. 13. Ginsberg, HN, Zhang, YL & Hernandez-Ono, A (2006) Metabolic syndrome: focus on dyslipidemia. Obesity (Silver Spring) 14, Suppl. 1, 41s–49s. 14. Accurso, A, Bernstein, RK, Dahlqvist, A, et al. (2008) Dietary carbohydrate restriction in type 2 diabetes mellitus and metabolic syndrome: time for a critical appraisal. Nutr Metab (Lond) 5, 9. 15. Fukuchi, M, Watanabe, J, Kumagai, K, et al. (2002) Normal and oxidized low density lipoproteins accumulate deep in physiologically thickened intima of human coronary arteries. Lab Invest 82, 1437–1447. 16. Meisinger, C, Baumert, J, Khuseyinova, N, et al. (2005) Plasma oxidized low-density lipoprotein, a strong predictor for acute coronary heart disease events in apparently healthy, middle-aged men from the general population. Circulation 112, 651–657. 17. Holvoet, P, Mertens, A, Verhamme, P, et al. (2001) Circulating oxidized LDL is a useful marker for identifying patients with coronary artery disease. Arterioscler Thromb Vasc Biol 21, 844–848. 18. Soran, H & Durrington, PN (2011) Susceptibility of LDL and its subfractions to glycation. Curr Opin Lipidol 22, 254–261. 19. Chait, A, Brazg, RL, Tribble, DL, et al. (1993) Susceptibility of small, dense, low-density lipoproteins to oxidative modification in subjects with the atherogenic lipoprotein phenotype, pattern B. Am J Med 94, 350–356. 20. Lyons, TJ & Jenkins, AJ (1997) Glycation, oxidation, and lipoxidation in the development of the complications of diabetes: a carbonyl stress hypothesis. Diabetes Rev (Alex) 5, 365–391. 21. Welty, FK (2013) How do elevated triglycerides and low HDL-cholesterol affect inflammation and atherothrombosis? Curr Cardiol Rep 15, 400. 22. Holvoet, P, Kritchevsky, SB, Tracy, RP, et al. (2004) The metabolic syndrome, circulating oxidized LDL, and risk of myocardial infarction in well-functioning elderly people in the health, aging, and body composition cohort. Diabetes 53, 1068–1073. 23. Salazar, J, Olivar, LC, Ramos, E, et al. (2015) Dysfunctional high-density lipoprotein: an innovative target for proteomics and lipidomics. Cholesterol 2015, 296417. 24. Forsythe, CE, Phinney, SD, Fernandez, ML, et al. (2008) Comparison of low fat and low carbohydrate diets on circulating fatty acid composition and markers of inflammation. Lipids 43, 65–77. 25. Volek, JS, Fernandez, ML, Feinman, RD, et al. (2008) Dietary carbohydrate restriction induces a unique metabolic state positively affecting atherogenic dyslipidemia, fatty acid partitioning, and metabolic syndrome. Prog Lipid Res 47, 307–318. 26. Diamond, DM & Ravnskov, U (2015) How statistical deception created the appearance that statins are safe and effective in primary and secondary prevention of cardiovascular disease. Expert Rev Clin Pharmacol 8, 201–210. 27. Hourcade-Potelleret, F, Laporte, S, Lehnert, V, et al. (2015) Clinical benefit from pharmacological elevation of high-density lipoprotein cholesterol: meta-regression analysis. Heart 101, 847–853. 28. Liao, JK & Laufs, U (2005) Pleiotropic effects of statins. Annu Rev Pharmacol Toxicol 45, 89–118. 29. Toth, PP, Grabner, M, Punekar, RS, et al. (2014) Cardiovascular risk in patients achieving low-density lipoprotein cholesterol and particle targets. Atherosclerosis 235, 585–591. 30. Howard, BV, Van Horn, L, Hsia, J, et al. (2006) Low-fat dietary pattern and risk of cardiovascular disease: the Women’s Health Initiative Randomized Controlled Dietary Modification Trial. JAMA 295, 655–666. 31. Anonymous (1982) Multiple Risk Factor Intervention Trial. Risk factor changes and mortality results. Multiple Risk Factor Intervention Trial Research Group. JAMA 248, 1465–1477.